Ladakh is distinct in its culture and geography as it has lots of special things to offer and take along with for your friends and family. The arid cold dessert of Ladakh has sustained through the ages depending on scarce resources, and within this limitation they faced the challenges to not only survive but carved out a vibrant and dignified lifestyle. The traditional dresses, woodworks, paintings, thankas are the chief local arts made by hundreds of local artisans. Local products such as Apricot juice and jam are common in local market, and sea buckthorn juices cater to the markets beyond to other parts of India. These two products are important livelihood sources for hundreds of local people in villages. Besides, there are several women groups engaged in making woolen caps, socks, gloves, mufflers, sweaters, pattu, traditional man and woman dresses etc. which help them to improve their financial savings and empower themselves. 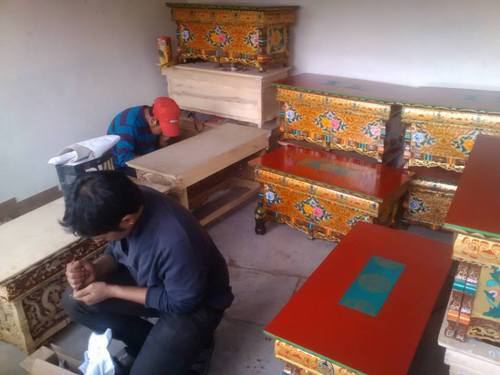 One of the most prospering businesses is pashmina production by, especially, nomads of Changthang. Pashmina, the soft undercoat of goats in Changthang steppe of eastern Ladakh, is popular for its finished product the world famous Pashmina shawls made by Kashmiri artists. Nowadays even locally made pashmina shawls are available in the market. One of the most encouraging initiatives is the several products of daily use out of waste materials by disabled people. They make cushions, cushion covers, a variety of paper works such as table spread, frames, vases, paper bags, envelops, diaries etc.